When it comes to roofing companies, it’s hard to know what to look for, who you can trust and who provides the best results possible. Let’s face it, your roof isn’t something that you want to have screwed up if it needs to be repaired or replaced. It provides shelter from the elements and saves us money on energy bills if we have a roofer who installs the best roof possible. Nobody wants to deal with a person or company who might take advantage of them, cut corners that will cause safety concerns or financial problems. But how do you know what to look for when choosing a roofing contractor? Well, here are some warning signs that will help you know what NOT to accept. Here are some signs you need to keep a watch for. They should raise red flags if you notice any of them and it would be best for you to move on and find somebody else. And remember—check the references! They tell you a lot of what you need to know. No Insurance, Bonding Or Licensing. This is a major red flag. Making sure your roofing company like NMB Roofing Pros is properly bonded and insured will protect you against shoddy workmanship or even damage to your property. The financial risk is just too great if they are not carrying the proper insurance and bonding. Steer clear of such companies. Cold Call Selling At Your Door. Good reputable companies are not going to knock on your door in order to try and get your business. They will go through much more valid means of advertising. Legitimate roofing companies will not have the free time to be driving around trying to get new clients. Failing To Do A Roofing Inspection Before Giving A Quote. While it might seem to make sense that a professional could draw on his experience to give an estimate, the fact is that with all the variables that roof repair may throw at them, a roofer should always give you a proper estimate after a roof inspection. Doesn’t Put All The Details In Writing. This is another big red flag. You should never hire ANY company to do anything around your home that they don’t put in writing. When it comes to roof repairs, you should have in writing the materials needed, how long the job will last, description or the job in detail, as well as the estimated cost upon completion. Do not hire any roofing company that fails to provide any of this information. Asking To Be Paid Ahead Of Time. This is not okay. 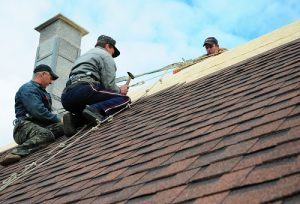 It can be acceptable for them to ask a small amount to get started with materials and supplies, but any reputable roofing contractor North Myrtle Beach will not need to charge you huge prices up front. It raises all kinds of warning signs. If you go with a small company, they should never ask you for more than 10-15% up front. There will no doubt come a time as a homeowner that you will have to deal with roof repair or roof replacement. Follow these tips to make sure you get the best outcome possible. Call NMB Roofing Pros if you want to make sure that you are working only with a reputable and experienced roofing company.